not bad, but it will only see play if we get some good mech to combo this with. I just dont think it will be worth it to play this understatted minion, and hold a mech in your hand until this dies. the whole thing just seems like bad tempo. Mechs >_> Doesn't seem too fantastic yet. It's kinda slow imho, unless people use it the same way druids used Witching Hour and Hadronox (i.e. as some sort of a win-condition). Here's a list of all neutral and hunter deathrattle mechs. My guess is, that Dane will include Oblivitron in his N'zoth Reno hunter deck and make a video about it. Feels like we will really have to wait and see on this one. 2) we'll have to see what they are in order to really evaluate this. 3) the stats are freaking miserable. And people were complaining about 5/5 hagatha for 7. 4) Hunter lost a ton/all of sustain/heal - this may still be too slow even with added support. EDIT: Another thing to note is that you can support this with a very specific package and just bomb drop things like Bull Dozer while running an otherwise completely normal deck. Not unlike Kathrena. Sneed's Old Shredder great again! Okay, maybe not. If you kill this minion with Mecha'thun as the last card in your hand and deck and the deathrattle activates will it work or no because mecha'thun is still on board? Here’s hoping this doesn’t get the Herald Volazj treatment and get 0 support. Then again, I guess Hunter “deserves” it at this point. I believe it would not work because he's still on board. So, looks like hunters will represent mech builders of Dalaran. I doubt that this is the only their mech and expect to see more mechs. Kind hunter's mechs of Dalaran vs Warriors mechs of dr boom. Who knew that we'll get another expansion with mech so soon after doomsday? 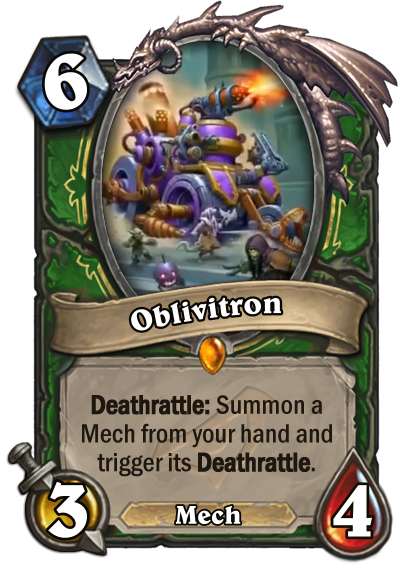 Sure the power level will drop alot, but you need to fit in some powerful deathrattle mech (which we still need more) and have them in your hand and hope this dont get silenced. I would play a Beast Hunter always over it with the current Cards. This minion should of been a 4-cost minion but since the Fireworks Tech is still in the game, they wanted to be careful. Regardless, I think this minion is horrible. It's probably not the worse that we will see but I don't think anyone would love to this minion unless it gets some really good support. Potentially good in Wild, kind of limited use in standard where there are far fewer robut cards to work with. e: upon further consideration, this card will be hot salted trash unless or until more mech deathrattles are added. Hard pass. On wild very good! You will mark my words. Hopefully Necromechanic will see some play now. But hunter's are still gonna need more deathrattle activators than just Fireworks Tech. Or maybe they don't want as many activators anymore because play dead and terrorscale stalker are pretty damn good.